Eyesight is one of the most important aspects of a person’s health. Taking care of our optical health should be high on our list of priorities. Because when our eyes deteriorate, there’s usually not a lot we can do to reverse it. As a blogger, your eyesight is essential to reading and writing articles. It is also needed for viewing photos, films, nature, and any other topic you’re hoping to write about. Therefore, it’s important to understand risk factors and what you can do to avoid conditions that may affect your sight. One of the main reasons doctors insist on limiting your time in front of TVs, laptops, and cellphones is due to blue light exposure. On the colour spectrum of visible light, blue light is made up of shorter wavelengths than red or green light. Blue light is also higher in energy. Exposure to extensive amounts of blue light is relatively new due to the growth in technology. This means computer screens and mobile phones, which means our eyes have not yet adapted to so much high-energy light. Excess exposure to blue light is speculated to cause eyestrain, headaches, macular degeneration, and melatonin suppression. This makes it harder for a person to fall asleep. Macular degeneration, or damage to the retinal cells that leads to vision loss, becomes more common with age. If you’re a veteran blogger who has spent years working in front of a computer, it’s especially important to take preventative measures to maintain your eye health. Excess exposure to blue light is a common risk of working behind a computer for eight hours each day. However, there are several other risk factors to eye health. This includes the shining summer sun, the glare of the sun on snow, or even forgetting your annual optometrist visit. In every season, UV protective sunglasses are essential to protecting your eyes from bright light that can hurt your eyes. Even in winter, snow can reflect sunlight so that it’s coming from the ground as well as the sky. This can be more damaging to your eyes than a bright summer day. All these risks to your eyesight mean it’s really important for your eyes to be checked annually by an optometrist. If you’re someone whose eyes worsen regularly, get your glasses or contacts regularly updated. This is important to preventing your eyesight from worsening. Skipping an annual checkup could mean your eyes don’t get the attention they need to stay healthy at work. This could cause your eyes (and your work) to suffer. Eye strain and headaches have caused many individuals and workplaces to seek out ways to avoid the repercussions of working in front of a computer all day. Some workplace strategies include adjusting your screen brightness to your surroundings, taking short walking breaks every hour, and investing in stand-up desks. Another common suggestion is to follow the 20-20-20 rule. This is giving your eyes a 20-second break from your computer screen every 20 minutes. You includes looking at something at least 20 feet away. Taking care of your eyesight falls in line with taking care of the rest of your body. Eye strain can be a direct effect of spending too much time online and not enough time doing other thing. However, there are additional consequences that come with a sedentary lifestyle. For example, the American Heart Association attributes an increase in obesity to the increase in working professionals who spend their careers being relatively inactive, often spending more than eight hours per day in front of computers. This has caused healthcare providers to reassess the way they communicate with patients about their health in hopes of establishing health plans that address all areas of their healthcare. Medical professionals are doing this by more regularly screening a patient’s body mass index (BMI). They initiate conversations about weight management, and develop weight loss plans with their patients to help them achieve these goals and improve their overall health. As a blogger, there’s a lot to keep in mind as you focus on producing content for your readers. Although you may be eager to spend all your time online engaging your blog visitors, it’s important to minimise potential risks to your eye health and overall physical health by taking enough breaks away from your computer. 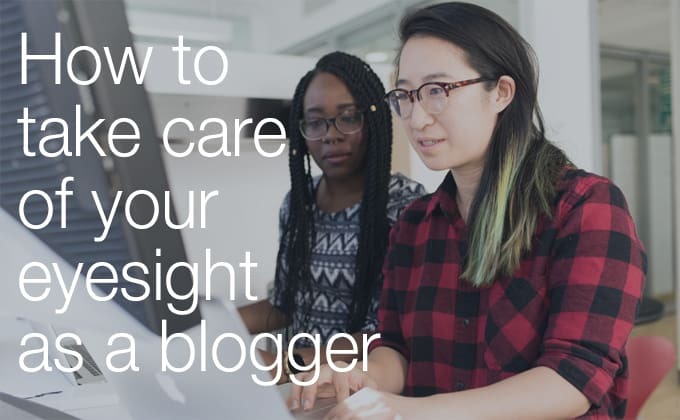 Maintaining a blog is an exciting venture, but it’s important to remember that your physical health, including your eyesight, should always be a major priority.